It struck me as an interesting coincidence that in the week of the 50th anniversary of the publication of Robin Boyd’s The Australian Ugliness I was asked to write about Kennedy Nolan’s Laver House in Kew. 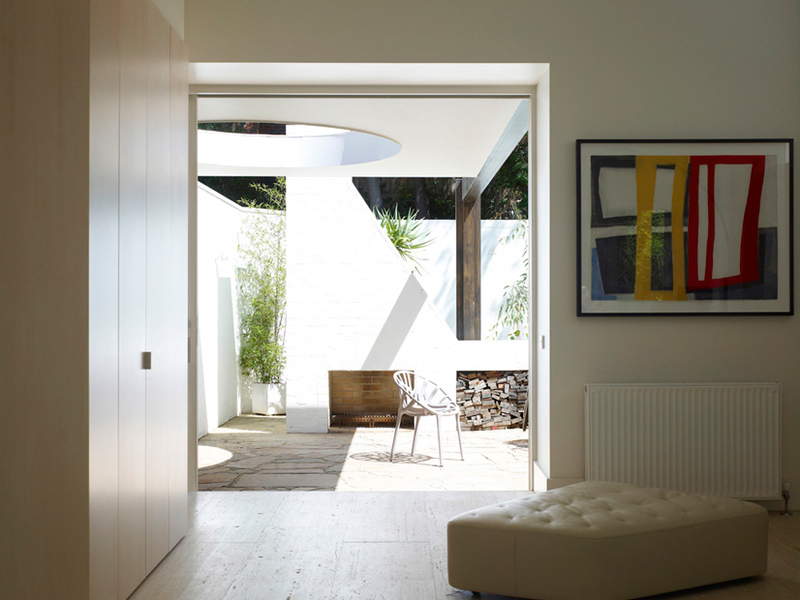 For me, Kennedy Nolan’s work has always embodied an honesty conjured out of a pared back aesthetic, of dextrous design and natural materials typical of mid-century architecture. Add to that the Mark Strizic photographic documentation of the studio’s early work and there’s a tangible connection to this resonant era of Modern Melbourne. It was with ‘Razorblades’ Boyd in mind; his inquiring intellect, and the ubiquitous question of what makes a worthy suburban contribution that I visit the Laver House. Rising up the steep escarpment of the entry pathway, I am surrounded by the most gorgeous, soft, lazy Australian vegetation. All blue and green and smelling good. My brain is meandering back to the Grampians, and I have to stop and secure my footing to get a first look at the building the presence of which I have constantly felt standing sentinel at the top of this challenging and delightful site. There it is; an expanse of white canvas for all of those eucalyptus trees to paint their shadows on in an ever-changing exhibition of Australian art. 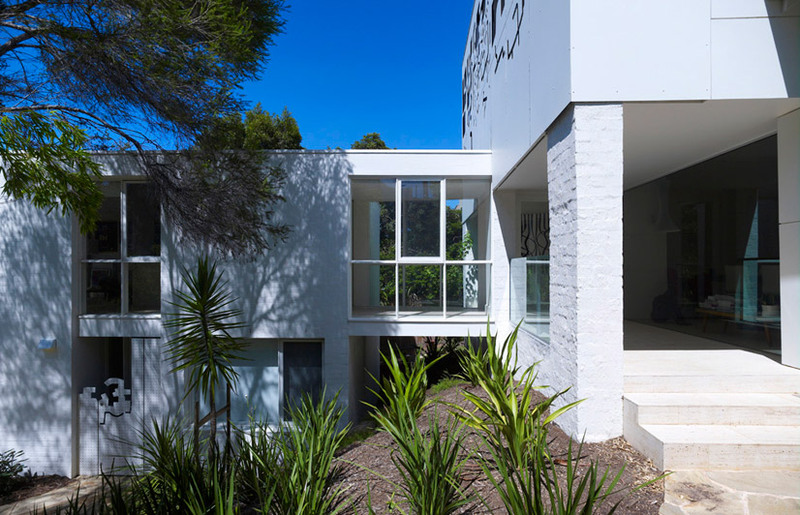 Mark Kader’s landscape design reveals his horticulturalist tendencies – he clearly loves native vegetation, and in the Laver garden, with a clear vision for this blank canvas, he has nimbly negotiated the steepness of the site to paint it with vigour. The impossibly vertical ascension to the house comes to a grinding halt in the considerably compressed horizontal space of the entry porch. Suddenly I have arrived in the house, and my pent-up gaze floods out in multiple directions across the horizontal plane, always with as strong a connection to the landscape as the architecture. I absorb the living space and am already out in the rear courtyard enjoying the open fireplace before I have even passed the entry threshold. That’s what this house does so well. It entices you up – concealing everything during the eternal entry promenade, and then revealing everything in a single moment. You want to stay because you feel protected and connected in equal measure. The moment I step inside I can feel the confident hand of these experienced architects. Kennedy Nolan’s interiors are beautifully composed. The palette of textured cream surfaces bolstered by the purity of white makes for an impeccably calming and satisfying field of vision. Limed timber joinery is soft and warm and embraces me throughout the house, and is often bevelled and off-grid, so as to promote a meandering line throughout the building, creating spaces and objects to explore and touch. Strong sculptural elements appear where they are most useful and enjoyed. 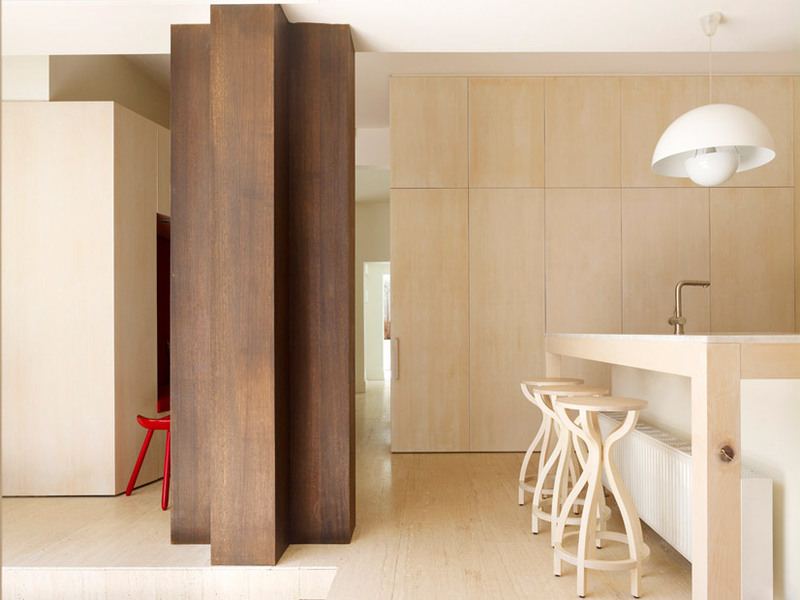 In a playful chess-like stand-off, an oversized timber cruciform column at the edge of the kitchen is the internal ballast to the external brick fireplace and wood store in the adjacent courtyard. Journeying up into the quiet of the sleeping zone, I am surprised at the effectiveness of the bold screen stretching across the eastern façade of the upper level addition. 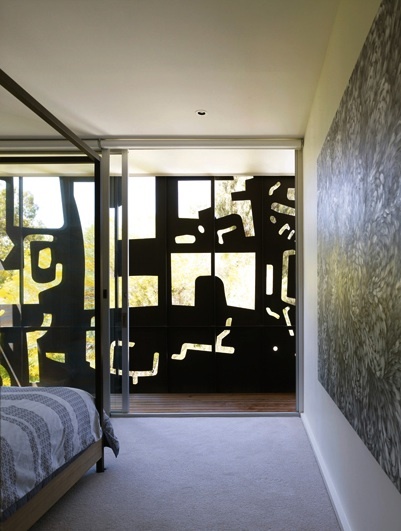 In something of a strange two-dimensional melding of Clement Meadmore, Keith Haring and Rover Thomas works, the screen – white externally and black internally – softly frames and filters in such an intriguing pattern that it is somehow much more an intimate sheltering element and less of the public face of the ‘new’ house that I expected it to be. 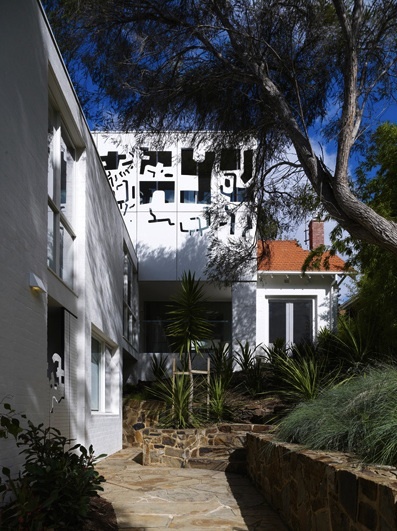 Where the suburban house is often criticised for being complacent about its visual environment, the Laver House makes a genuinely optimistic contribution to this rarefied pocket of leafy Kew, and to Melbourne’s suburban collection more broadly. Kennedy Nolan’s reworking of this previously renovated house (late Edwardian and then 80s) respects its site and context with an elegantly united architectural solution to the classic ‘alts ‘n’ adds’ challenge, embraces it through multi-level and multi-directional connection with the landscape, filters it through carefully placed screening elements and generates a singular architectural gesture out of a tripartite group of potentially unengaged elements. The salient problems of the suburbs as defined by Boyd were – and still are – sprawl, aesthetics and sustainability. The Laver House is an excellent counter to Boyd’s “unthinking aesthetics of our suburbia” simply in breathing new life into a tired building, by not allowing it to wallow in redundancy and architectural erraticism. Kennedy Nolan has taken a disjointed building and cured its split personality disorder by applying a well-orchestrated series of material and formal tactics with fluency and skill. These architects have reduced the previous anomalies, and introduced strong guiding principles for the building that are robust enough to ensure that the line between new and old is difficult to identify. They answer the question of how to contribute well to the suburbs by doing precisely what Boyd expected of them – in order to densify the suburbs, you must make better use of the space, efficiently and more pleasurably. There will be none of the famous verbal laceration here – this is a formally and programmatically engaging house, and it is a cohesive singular building that will stand and deliver for decades to come. Great house. Wondering what the flooring is? It’s a travertine, layed rough side up. Excellent work. What is the timber to the cupboards? Love this project and love Kennedy Nolan’s work. On the article….. densification: is about creating space for more people to live not more building density. The typical alteration and addition to a house (which we also do a lot of) does not lead to to the kind of densification that is desirable and sustainable and that Boyd was seeking- i.e. a denser city… a city of more people living closer together………..rather it just leads to bigger houses for less people.